As well as belaying from the bottom of the crag like we do when someone is top roping a route, we can also belay from the top of the crag. This takes a little more practice than bottom belaying as everything in essence feels upside down. In fact if you image belaying stood on your head that is a pretty good description of how belaying from the top of the crag feels. There is more to belaying at the top of the crag as well. 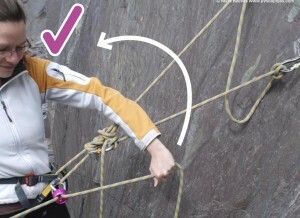 Dependent on what way you stand or sit, one of you hips or shoulders will be closer to the belay. Whatever side this is, it it this hand that you should use as the break hand. As such you now need to potentially be ambidextrous. As the dead rope now needs to be facing back towards the belay not to the ground. 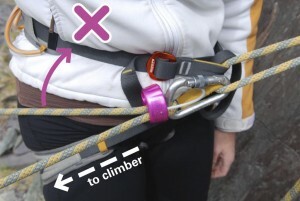 An incorrectly aligned belay plate for top roping. As you can see the body gets in the way of locking the rope off properly, making it extremely likely that you will drop the climber it they fall. 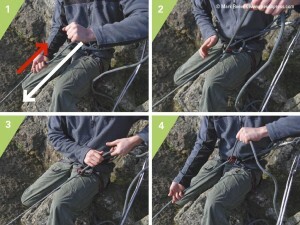 Attaching the belay device to the rope loop adds a small amount of extra dynamic stretch into the system as the knot tightens. This will reduce the impact force on trad runners or when sport climbing. When belaying a lead climber being tied into the end of the rope makes it impossible to lower the climber of the end of the rope, a common mistake when sport climbing on long routes. 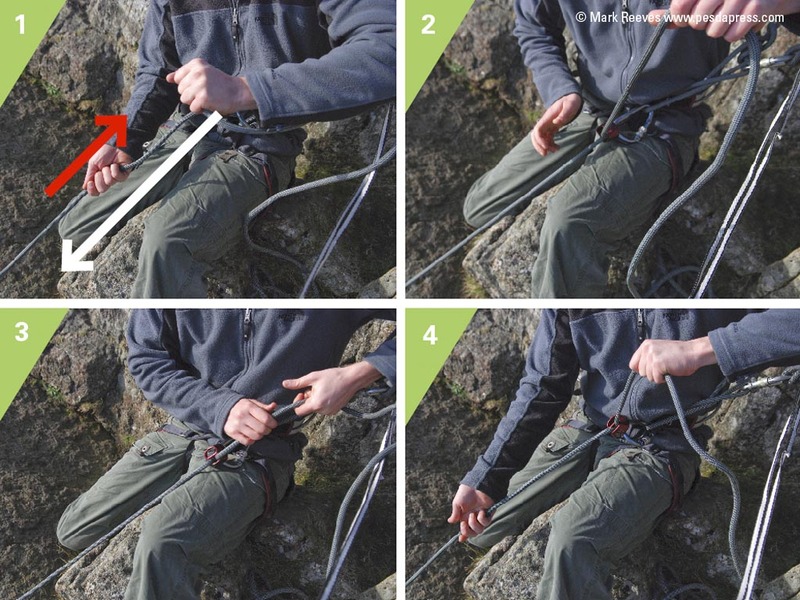 Having established the correct stance and aligned the belay plate correctly the pattern of belaying is similar to that of when belay a bottom roping system, but instead of point up the whole pattern points down. The simplify version is to 1) take the rope in. 2) lock the rope off. 3) hand swap. 4) back to the beginning. Belaying top rope. Notice how the taking in is going down and locking off is now going up. Remember that the rst time you do this just like the belaying a top rope you need someone to tail the dead rope as a back up. Preferable someone experienced and sitting down back from the edge.